The spectrometer is housed in a metal case finished with a blue enamel paint (measuring roughly 40 x 50 cm at the base and around 20 cm high). A standard white incandescent bulb serves as a light source which may be passed through a few coloured filters before entering the housing itself. The beam is collimated using curved mirrors and a prism is used in conjunction with a plane mirror to select the wavelength of light to be used. This is arranged so that the only light to pass into the sample is the light that passes through the prism to reflect off the mirror and travel back through the prism in exactly the right direction to be fed into the sample chamber. The light passes through a slit before entering the sample chamber and passing through the sample to a photo-multiplier tube which produces a signal to be amplified by a valve, then causing a rotating scale similar to the wavelength selector to display the transmitted intensity of light. The size of the slit before the sample chamber is regulated by a finely tapped screw in combination with a series of thin metal sheets as springs. This assembly is designed to possess almost no backlash. The slit itself is a curved shape to eliminate the aberration produced when imaging a straight slit with curved mirrors. Throughout the whole instrument, very careful design and construction are used to make it very precise. The spectrometer is the instrument around which the vast field of spectroscopy is based. This field has application in almost every area of science today, from the analysis of stars, galaxies and other bodies in space, right down to being instrumental in the determination of the structure of the atom. The absorption spectrometer is used to study the interaction of partially transparent substances with light - specifically how much light is transmitted and absorbed. For example, they enable the accurate determination of the absorption of coloured indicators allowing the progress of chemical reactions to be monitored. 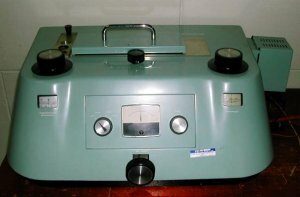 The SP600 Visible Absorption Spectrophotometer was released in the mid 1950s and became the industry standard for visible spectrometer round the world. The continued in production until 1976 and there are many such instruments in laboratories even today. This one was used in a laboratory at Greenslopes Hospital.